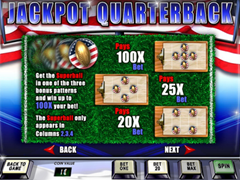 Jackpot Quaterback Pokie Review - Play today! The game is based on American football but you surely don’t have to be a football fan to enjoy the incredible wins. Kick off your career win on 5 reels offering 20 paylines covered in team emblems. The game has a full line up of fantastic features that eagerly want to spin in the victory wins with wilds, scatters and huge multipliers. The game offers a progressive jackpot with an ever accumulating amount that can offer life changing wins. The main game offers a second highest payout of 2,000 coins and the multiplier rewards wins up to 100 times your original bet. The game offers 20 lines to play with, which can take a maximum bet of 5 coins per line. This means a maximum bet of 100 coins per spins can be reached per spin. This amount will be required if you are interested in taking home the progressive jackpot amount that is displayed above the reels during the game. Each coin you wager will have a value that you can choose from $0.01 to $1.00. this means a wagering window is available from $0.20 to $100.00. 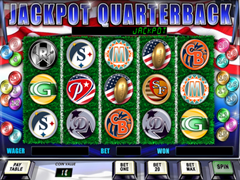 With the Jackpot Quarterback logo displayed in big bold blue letters the game starts seriously on the fast spinning reels. The backdrop offers the American flag also called the union jack with colours of red white and blue. Be the star of the game when you spin in the biggest win with symbols represented with different team emblems. The colourful illustrated symbols offers the D team emblem in grey with black stars, G team is offered in gold with green line, the SF team is mustard and maroon, NY team has the emblem of the lady of liberty, the super M team have soft turquoise and orange team colours, team R’s emblem is two crossed swords with grey and black lines. The reels is offered on a green grass football field with the white lines to separate the reels. Bonus symbols in the game are the superball symbols with the golden superball shown on the American flag. The symbols are the wilds in the game that will be able to complete combinations for all the other symbols you manage to gather on the reels. These symbols will need to show up in a positions where symbols are needed though before the features can be rewarded. The superball symbol will award you with massive multipliers as well when you manage to get them in certain combinations that are displayed in the pay-table. There are 3 different combinations you will need to get to win of 3 multiplier payouts. You can win up to 100x with these symbols. The winnings are multiplied by the total amount you have wagered per spin. Kick off extraordinary wins and then trigger the multipliers to give super high pay-outs. The game offers colourful well detailed symbols that makes every spin an eye pleasing display of winning combinations.